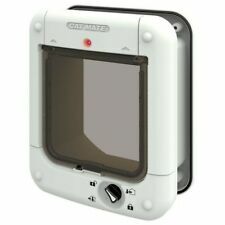 Cat Mate Microchip Cat Flap, Door, Lockable, Battery, Programmable BNIB. Never been out of box. With instruction book. Opens with tag on cat The elite cat doors introduces many major breakthroughs in electronic pet access control using radio frequency identification (rfid), incorporated in an ultra-modern, slim-line design. All flaps feature a clear, stylized, fully draft and weatherproof brush sealed flap with a secure locking system. The elite cat flaps feature universal installation capability, being easily fitted to glass, wood, metal, plastic or wall applications Front and back plate not been used but unboxed. Doesn’t include the cat tags. Cat Mate Elite Selective Cat Flap With Timer Control. Condition is New. Dispatched with Royal Mail 2nd Class. 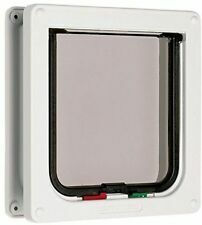 Cat Mate Microchip Cat Flap, Door, Lockable. Includes microchip tags. Condition is New. Retails for £55. Cat Mate Cat Flap Wall Liner. Condition is New. Dispatched with Royal Mail 2nd Class. 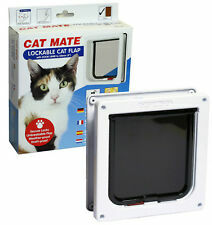 CAT MATE LOCKABLE DOOR CATMATE FLAP WHITE. Condition is New. Dispatched with Royal Mail 2nd Class. Embossed locking directions to assist the user. It can be expected to be in full working order. Minor imperfections which will not affect the overall performance of the item may be present. Cash on collection, this can only be done if you press the buy it now button on the item. Cat Mate Cat Flap Adapter Kit for Walls and Glass Panels Easy Fit 361w Posted today if paid before 1pm - Sent 1st class Features: Allows easy installation into walls and glass panels ---Paintable to blend adapter plates in with surrounding decor ---Supplied with a rubber adapter seal for a fully weatherproofed installation ---Easy to follow fitting instructions ---For use with Cate Mate refs. 360,359 and 358 cat flaps only The Cat Mate Cat Flap Adapter Kit is all you need for an easy installation into walls and glass panels for the Cat Mate Microchip Cat Flap. For glass installation, you will need a glazier to cut a 263mm diameter hole in the panel. The two adapter plates are then placed between the glass panel and the inner/outer frames of the cat flap, which then simply fit in together through the aperture. © Pet Stuff Galore. Buy now and save! 4-Way Locking with Liner (235). You might also like. Cat Mate Elite Wall Liner Door Micro Chip Cat Flap Wall Tunnel Extensions 308W Posted Today if Paid Before 1pm! Description:Any number of these 50mm (2") sections may be added to any cat flap in the Elite range to enable easy wall installation. This tunnel is suitable with the Cat Mate Elite range of doors and the Cat Mate micro chip doors. 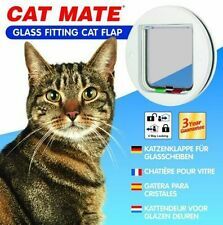 Cat Mate 235W 4 Way Locking Cat Flap.